They sang hymns in their own style. The clapping is slow for the first few verses then doubles in tempo. The intensity grows and the clapping becomes faster and more syncopated until the song ends with a wild flourish - at exactly the same tempo in which it began. The Top Forty at the time was full of Motown, whose churning beat under ballad memories was inspired by bass player James Jamerson, a Gullah who learned his music in a church not far from Moving Star Hall. In the mid-sixties, love of the blues united much of the American folk and English pop worlds. 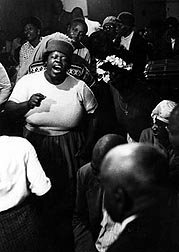 Most folk singers' repertoire included at least one song learned from a Leadbelly or Big Bill Broonzy record, while a large percentage of English pop groups started life as blues bands. Pink Floyd are named after Pink Anderson and Floyd Council, two obscure singers from rural South Carolina whose names appeared in the liner notes of a Blind Boy Fuller reissue. 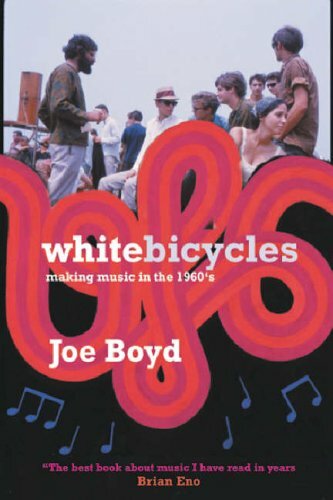 From 'White Bicycles - making music in the 1960's' by legendary record producer Joe Boyd, whose credits include Fairport Convention, the Incredible String Band, and Nick Drake. 'White Bicycles' is published on May 4th by Serpent's Tail, ISBN 1852429100. It is essential reading for any student of contemporary music, and I'll be returning to it again in the coming weeks. The title, incidentally, is from a song by Tomorrow inspired by the free transport provided by Amsterdam's revolutionary provos. Now playing - The Incredible String Band by ... the Incredible String Band. 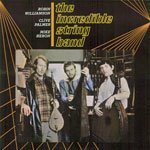 The first album by the ISB recorded in 1966 is somewhat simpler and more acoustic than their later albums, but still it's a million miles from the sort of folk music that was around at the time. Fame, and Scientology, were to follow.